I don't really care much for Halloween. I'm not a hater or anything; it's just not my thing. 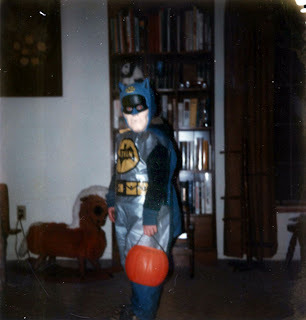 Halloween when I was a kid was kind of cool. You got an excuse to pretend you were Batman or Luke Skywalker or Indiana Jones or whomever, and you got a bucket full of candy. Hard not to love that as a kid. I understand the attraction of pretending to be someone else when you're a kid. You're still trying to figure out who you are and you can use Halloween as a sanctioned way to try on other roles. But I had a pretty good handle on who I was early on, and didn't feel any need to change identities. That sense of self has strengthened over the years and I have zero desire to pretend to be anyone else. In fact, I was a mildly irked when I first signed on to Second Life and couldn't use my real name as my screen name. I actually really like me, and don't have any interest in being anyone else. Even for one night. "OK, fine," you might say. "So you don' go to Halloween parties and dress up. You can still hang out at home and pass out candy to the neighbor kids." My ex-wife insisted that we participate each year and hand out treats to the kids. Primarily out of fear that our house would get egged. I was never keen on getting up to answer the doorbell every few minutes, but I made it a little more tolerable for myself by handing out comics as well. While I did get one or two really good reactions each year ("WOW! Hey, guys! He's passing out comic books!") I didn't get much out of it. Because the youngest kids didn't even know what was going on, the older kids didn't care at all and just wanted free candy, and the ones in the middle didn't seem all that into it either. Besides, it's not exactly cheap to buy a bunch of candy and/or comics mostly for people you don't know! So once we got divorced, my house lights went off on beggar's night. Since then, I've even made it a point to not even be home. Tomorrow night, I'll head up to the local Panera, have a relatively quiet dinner and read for a couple hours next to the fireplace; I've got a copy of Founders of Comic Fandom I haven't cracked open yet. What's funny, here, is that I think very favorably of Halloween, but my actual participation is not that different from your own. e.g., I'm not opposed to the idea of dressing up, but I'm not doing so. Handing out candy sounds fine to me, in theory, but I've never done so at any point in my adult life due to the types of housing I've occupied.